MCALESTER—Campers attending CrossTimbers Children’s Mission Adventure Camp this summer are having a blast playing in and on the water, climbing towers and flying down a zip line on the ropes course, shooting at targets with arrows, .22 caliber bullets or BBs, playing disk golf and using a huge sling shot to launch water balloons at their sponsors sitting on a porcelain “throne” in the middle of a field. They’re also learning that their faith is something that shouldn’t be kept bottled up inside them, about missionaries sharing the Gospel in Nepal and how the church planting movement is growing in their home state. Located on 560 beautiful acres in the Sans Bois Mountains alongside Lake McAlester, CrossTimbers caters to children who have completed grades 3-6. Eight general sessions this summer will be followed by a session for campers with special needs the end of July. In fact, the camp is sold out for the entire summer. “We were sold out at Christmas last year, and then we were able to add 20 more beds per week and we sold those out right after New Year’s in three days,” Jones said. CrossTimbers’ capacity is now at 180 campers, plus a staff of 24, for a total of 204. “It stresses how we can be transformed on the inside and it will show up on the outside,” Jones pointed out. Each day of camp focuses on a theme word or phrase and an accompanying Scripture verse. Each day, staff members wear t-shirts with the appropriate theme word or phrase and accompanying verse printed on them. The lessons also are emphasized during daily 30-minute Bible studies in the morning, of course, and during the evening chapel, which is led by a different camp pastor each week. Jones, whose camp code name is “Big Daddy,” leads the 3rd-4th grade study, while childhood ministry associate Keith Badgett, known as “Inspector Badgett,” leads the 5th-6th grade study. During week one, 21 campers made a profession of faith, while five more received an assurance of Salvation and eight made a rededication. There were two other decisions for a total of 36. As its name implies, missions is a big part of CrossTimbers daily life. “In the afternoon, we have our missions time and swimming, so while the boys are swimming, the girls are in their missions time, and then vice versa,” Jones said. Missions is taught at three venues, the craft cabin, Pennington Lodge and on a missions hike. Jones teaches about the art of making Chai tea in the craft cabin and helps campers make their own ceramic Chai tea cup. The campers paint the cups, which are then taken outside and fired in a kiln for about 20 minutes under Jones’ supervision. The missions experience in Pennington Lodge focuses on Hispanic churches in Oklahoma and features a short video on the work of BGCO Hispanic church planter Daniel Caceres. “Daniel is our featured Oklahoma missionary, and the campers learn about the work ongoing with Hispanic churches,” Jones said. The campers also are taught how to make and cook corn tortillas. A liberal application of butter and honey round out the experience, as could be expected. Campers also contribute to an offering taken each week for missions. They have the option of giving either to help buy Bibles in Spanish or purchase “Life Straws,” which are personal portable and highly effective point-of-use water purifiers for people lacking access to clean and safe drinking water in developing countries. During the first week of camp, the children donated $285.50 for Life Straws, and $164.25 to purchase Bibles in Spanish, for a total of $449.75. Jones said CrossTimbers’ popularity is borne out by its waiting list of churches wanting to attend. He thanked Oklahoma’s Baptist Builders for recently remodeling the cabins in which the campers stay, making the camp experience much more enjoyable. 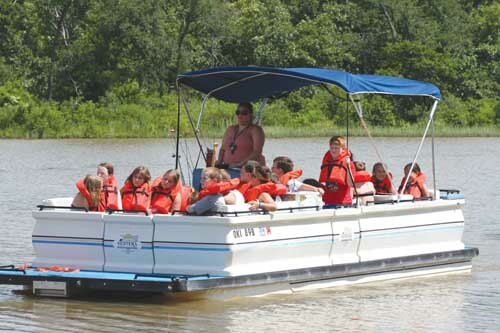 Two big additions to camp this year are another tower at the ropes course and two football field-length zip lines, which were provided through the offering taken at the State Men’s Retreat, and the donation of a pontoon boat so the campers can go out on the lake and fish. “Finally, the Cooperative Program provides all of our staffers and the supplies we need to have a great camp, so we can’t say enough thank yous for those who give to the CP,” he concluded.